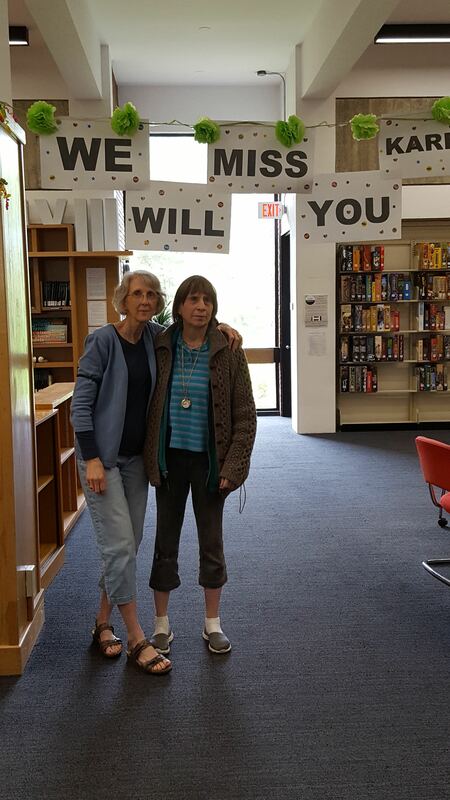 Many of you know Karen as she has worked at Hampshire College since its founding. She worked in a few different departments around campus starting in 1974 before coming to the library in 1999. Karen’s father, Andy Weneczek, owned 60 acres of land that the College purchased in order to create this experimental institution that would complete the “Five Colleges” (there is a lovely 1970 interview between Chuck Longsworth and Andy Weneczek in the online Enchridion. You can read about Andy’s commitment to Hampshire and the friendships and community he found here, which nicely parallel what his daughter, Karen, would find here as well). For the better part of twenty years now, Karen has helped to pull materials from the shelves each day to go out in the Five College Delivery so that Five College community members can enjoy our collection of books, cds, and dvds. 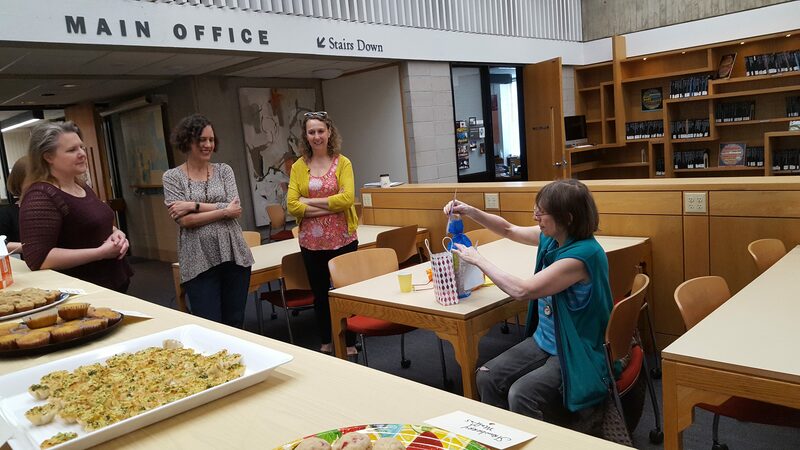 Karen is retiring from the College this week, and many library, Gallery, Media, IT, and other building staff gathered on Tuesday to surprise her with our well wishes. Karen loves going to the movies, so we presented her with a gift card to the cinema. 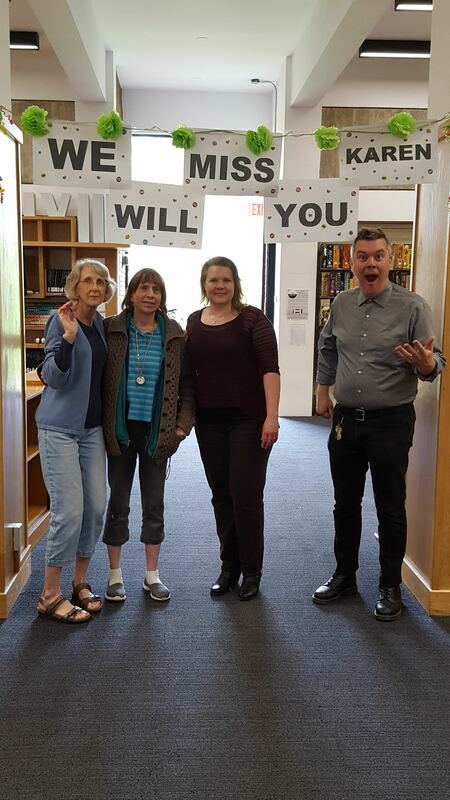 We will miss her steady presence each day, and hope that she’ll come back to visit us (and perhaps meet us for a coffee in the Kern building or meet us by the farm each spring when there are new baby animals!). 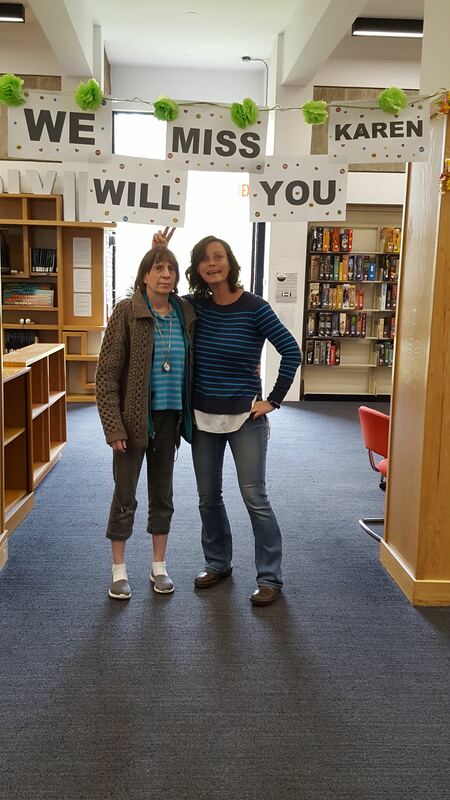 We are so very grateful for all of her years of service to the College. Karen with colleagues under the “We Will Miss You” sign!